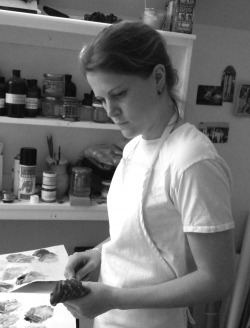 After deciding at an early age to explore a career in art, Natalie Marshall had the opportunity to grow into the field of painting restoration. Presenting her own education curriculum based on painting restoration programs around the country, she graduated from East Carolina University with a Bachelors in Multidisciplinary Studies. She holds a chemistry minor as well as a strong studio art, art history, and Russian humanities background. Following her undergraduate work, Natalie was invited to Moscow, Russia to attend the Surikov Art Institute’s Painting Restoration School. Natalie returned to the United States after 15 months abroad to work for Walls Fine Art Gallery as their restoration specialist. Desiring to broaden her experience, Natalie moved to New York City, where she was hired by Chelsea Restoration Associates and Simon Parkes Art Conservation. While there, she worked on paintings for the secondary markets, specifically Sotheby’s and Christie’s. She has had the honor of working on a wide array of artists’ works, from John Singer Sargent to Marc Rothko, from Claude Monet to Takashi Murakami. While her approach to restoration is rooted in the aesthetic over the scientific/academic, all of her restoration is completely reversible and uses the most perfected current materials and techniques. Natalie has a respect for the work of art, first. “Clients’ deadlines have sometimes turned us into ‘the emergency surgeons’ of restoration, but we never lose sight of the importance that each painting possesses.” The integrity of the piece remains primary throughout her restoration process. Natalie's painting career has been ongoing, behind the scenes.